Incorporating open-weave texture, the model doesn't just give you a non-slip surface but also massages your feet as you step on the mat. 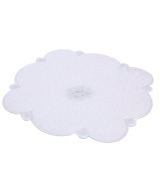 The mat is mould- and mildew-resistant and phthalate-free. It feels great on your toes and feet. The suction cups are so powerful that separating the mat from the shower can be difficult. This Mayshine mat is an excellent product through and through. It looks great and works just as great. 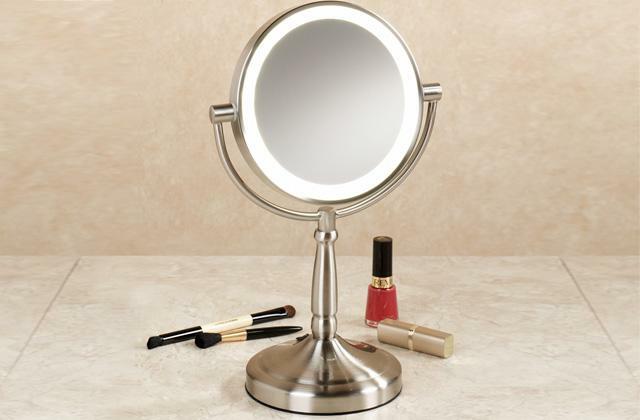 You can put it next to the bathtub or your shower stall so that you don't slip walking out of the shower. Plus, it is really easy to clean. 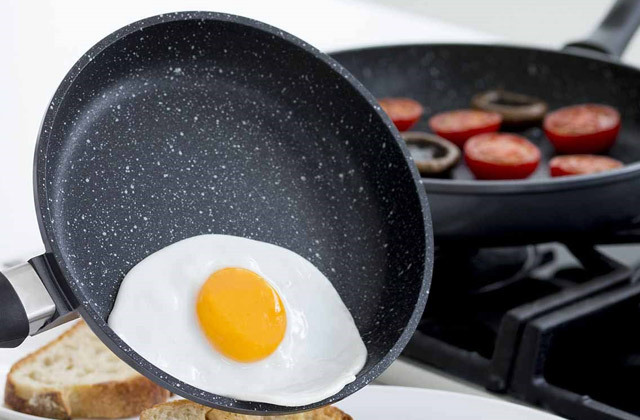 The vinyl rubber surface comes with anti-fungal treatment, making an appealing hygiene case for the product. The mat doesn't have a smell to it, doesn't fade, and isn't afraid of acids. The surface is a little harsh on the feet. 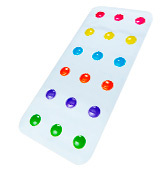 What we have here is a great shower mat, one you could recommend to most customers without any seconds thoughts. 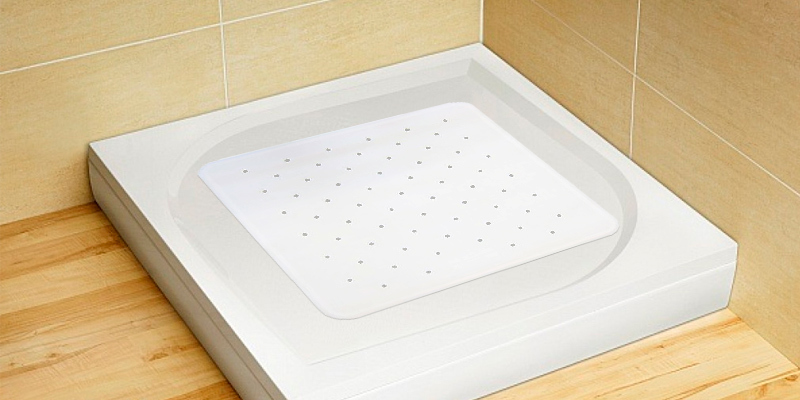 It has a nice minimalistic design that blends really well with most bathroom settings and is as effective and reliable as the next mat. The model is available in a wide range of colours. It provides 30% more coverage compared to your average mat like that. 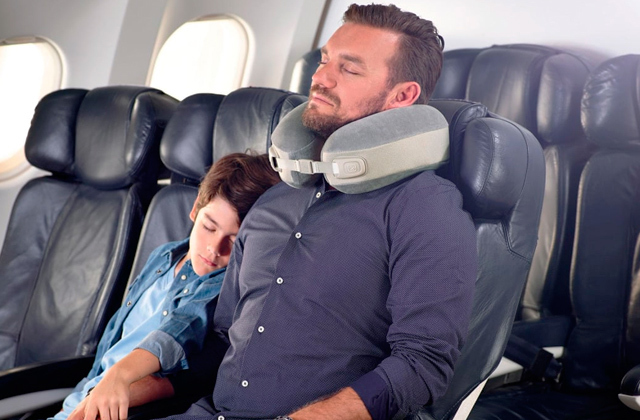 It feels cushioned and comfortable under your feet. The model is machine washable and you can just hang and air dry it after use. There's a slight plastic smell at first. 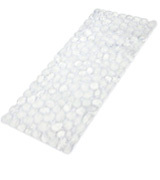 SlipX Solutions Extra Long Bath Mat is great for larger bathtubs. Likewise, it simply will not fit smaller tubs and shower stalls, so keep its overall dimensions in mind before making the final call. 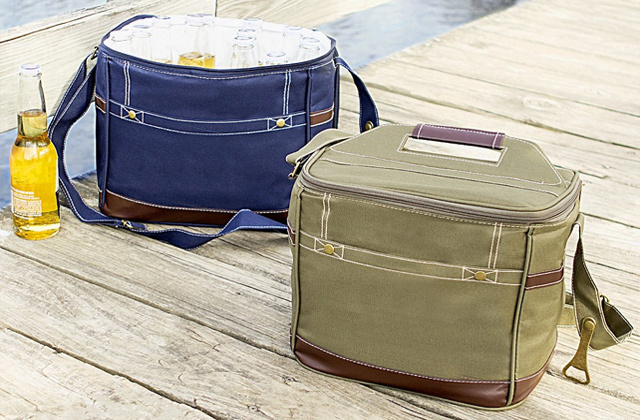 Provided the size fits, this is a solid, dependable product. The mat is latex- and BPA-free. Designed without any potentially harmful chemicals, the mat is even suitable for toddlers. It is easy to separate and remove from the bathtub bottom. The mat is relatively narrow. Children hate bathing. They find it unpleasant and uncomfortable, often making it a nightmare for the parent to bathe his little one. With this mat, you won't just be able to keep the child safe but also make bath time a fun and exciting activity for him and a less strenuous task for you. With its clear, rippled design, the mat looks good and will be able to seamlessly blend with any bathroom décor. It feels really nice to the touch and doesn't feel all too bad under your feet too. The rubber here doesn't deform with time. The model often comes wrinkled. 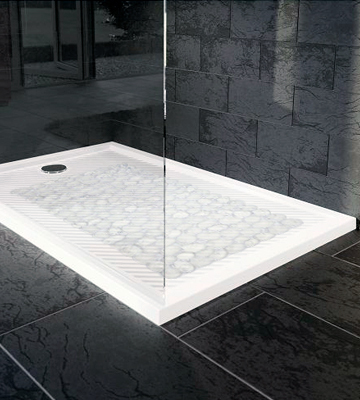 Posh Porschey Bath Shower Mat combines an attractive price with a well-thought-out and aesthetically pleasing design. 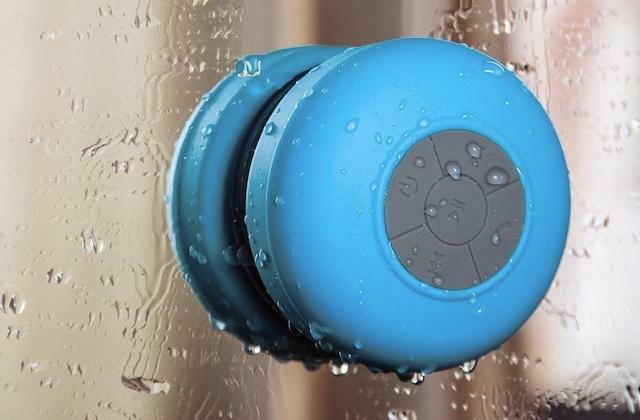 It is durable and will likely prevent you from slipping in the shower/bathtub. As far as we're concerned, that is enough to make the list. 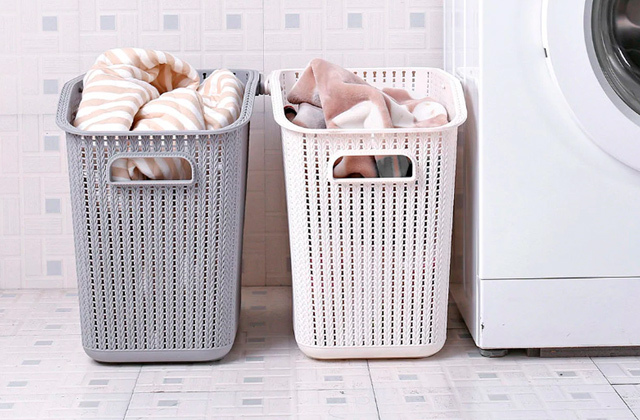 One thing that often prevents people from acquiring a shower mat is that they seldom look all that good, which isn't necessarily the best mindset but it does make sense considering how much time and money people spend to make their bathroom appear polished and elegant. But this mat from Mayshine is a slightly different story. As you can probably tell from the pictures, the model looks surprisingly good, especially compared to your average mat like that. But appearance is not the only thing that it has going for it. Incorporating open-weave texture, it doesn't just give you a non-slip surface but also massage your feet as you step on the mat. That and the thermoplastic rubber double the mat's water-absorption properties. The water flows fast and the model dries quickly. 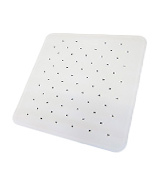 Furthermore, the aforementioned materials are mould- and mildew-resistant and phthalate-free, making this product easily the best shower mat on this list from the hygiene standpoint. 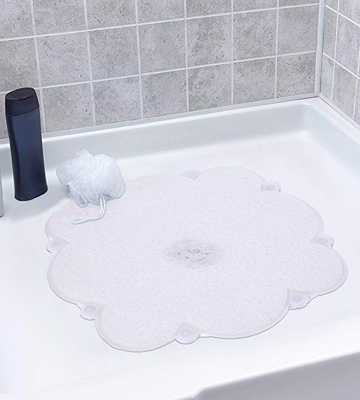 Frankly, the only issue we have with this mat is that its suction cups are so powerful that separating the mat from the shower can be a surprisingly difficult task. Other than that, this Mayshine mat is an excellent product through and through. It looks great and works just as great. 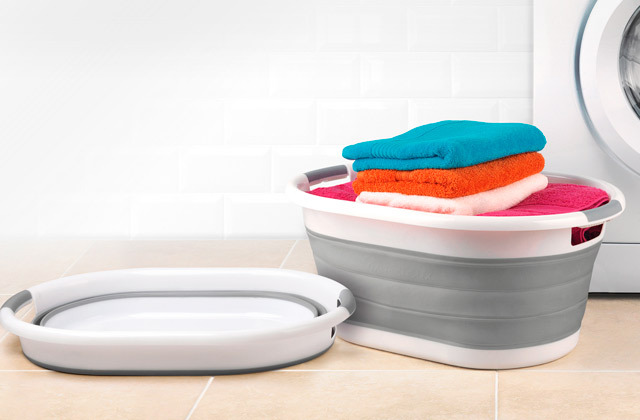 You can even put it next to the bathtub or your shower stall so that you don't slip walking out of the shower. Plus, it is really easy to clean. 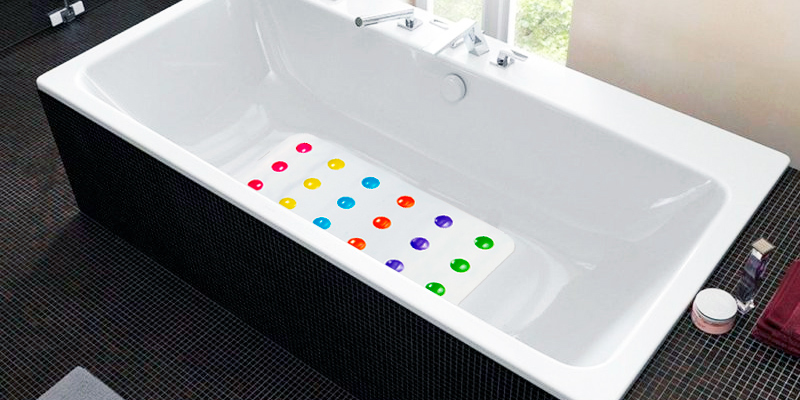 We really like this shower mat from TowelsRus. 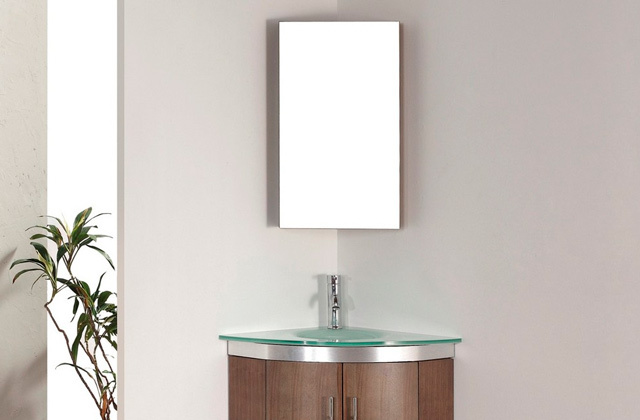 First things first, it has a nice minimalistic design that blends really well with most bathroom settings. It doesn't really attract attention and, for a mat like that, it is a good thing. Of course, with these things, it is less about the appearance and more about how effective and functional the model is. In this case, the model in question is almost too effective. 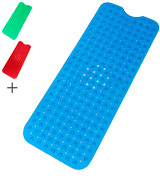 There's practically no chance you'll be able to slip, trip, and fall standing on this mat. Its non-slip qualities are so great that the surface feels a little harsh on the feet, a slight inconvenience, sure, but also a price that we're definitely willing to pay for safety. Furthermore, the vinyl rubber surface comes with anti-fungal treatment, making an appealing hygiene case for the product. 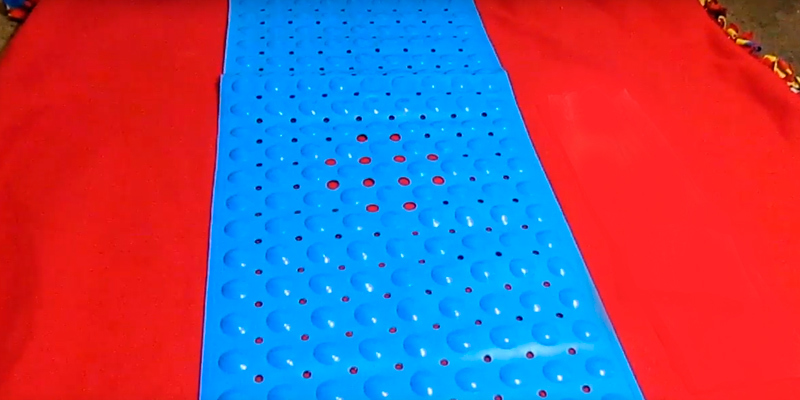 The other side of the mat is covered with strong suction cups that do an excellent job keeping it firmly in place. Apart from that, the model's advantages include the fact that it doesn't have a smell to it, doesn't fade, and isn't afraid of acids. You can wash it in a washing machine but the manufacturers highly recommend hand wash instead to prolong its service life. With all in that mind, what we have here is a great square shower mat one could recommend to most customers without any seconds thoughts. 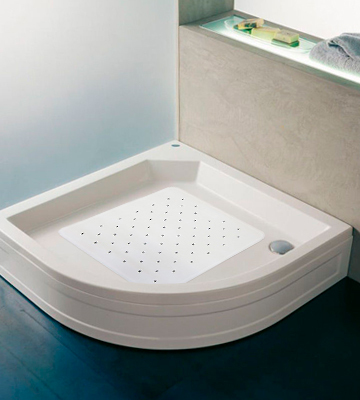 It goes well with most bathroom interiors and it is as effective and reliable as the next mat. As far as we're concerned, SlipX Solutions Extra Long Bath Mat doesn't look all that great. 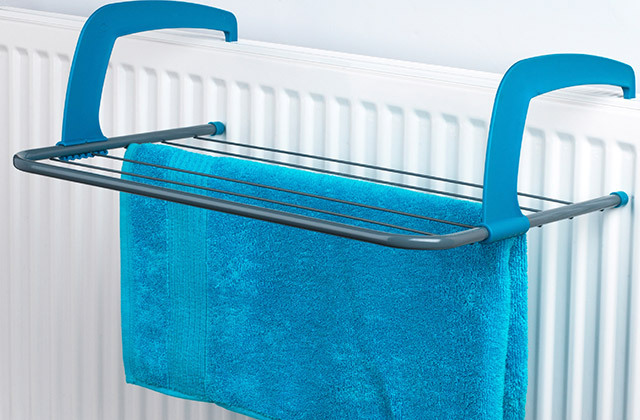 But, to be clear, we're talking about the blue version and the model is available in a wide range of colours, including "clear", light green, light blue, and grey and these look good enough with most bathtubs. Yes, bathtubs, because, measuring 40 x 100 centimetres in overall dimensions, the mat will simply prove too long for most shower stalls. You can see it as a downside but do keep in mind that the model also provides 30% more coverage compared to your average mat like that, which is always a plus in our book. It feels cushioned and comfortable under your feet, another little detail that we like in our mats. What we don't necessarily like in our shower mats, however, is a slight plastic smell that follows the model at first. Fortunately, it goes away in a few days. Holding the mat in place is a task reserved for 200 suction cups and they cope with it well enough to keep you and your family nice and safe. Maintenance shouldn't prove an issue either. The model is machine washable and you can just hang and air dry it after use. 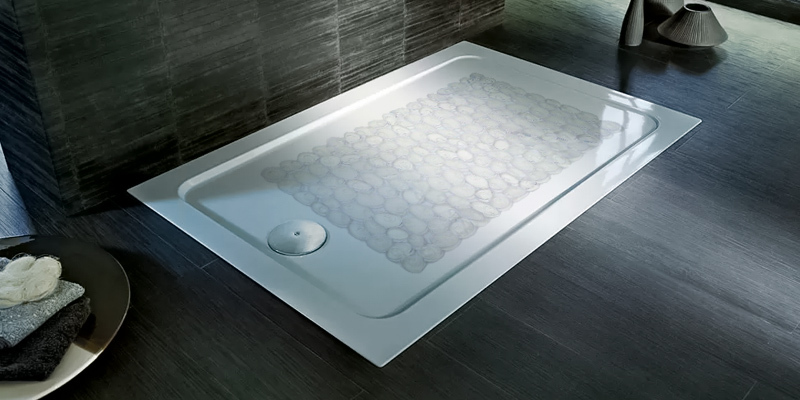 In other words, SlipX Solutions Extra Long Bath Mat is great for larger bathtubs. Likewise, it simply will not fit smaller tubs and shower stalls, so keep its overall dimensions in mind before making the final call. Provided the size fits, this is a solid, dependable product. 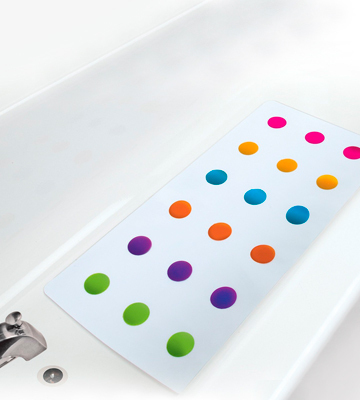 Munchkin 012194AMZ is particularly suitable for baby bathtubs thanks to its fun, colourful look but the model's size, measuring 36 x 77.5 centimetres in width and length, also makes it suitable enough for your average, regular bathtub. It is a little narrow compared to a typical mat like that but nothing that different. Most importantly, the model is great for children. Their skin is a lot more sensitive than ours and the immune system isn't as developed, so the latex- and BPA-free construction here is paramount. Designed without any potentially harmful chemicals, the mat is even suitable for toddlers. Other than that, this is more or less your average bathtub mat. Its skid-resistant suction cups keep the model in place. 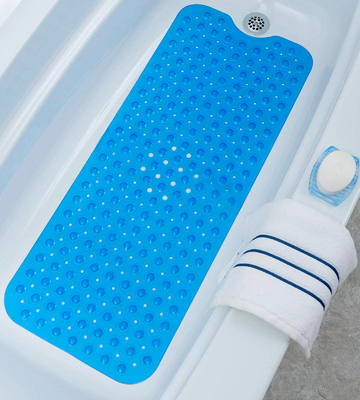 Nevertheless, the mat is easy to separate and remove from the bathtub bottom. The non-slip surface does its job and it does it well enough. The people behind this product recommend hand wash over machine wash, a slight inconvenience but nothing to complain about. Bottom line, children hate bathing. They find it tedious, unpleasant, and uncomfortable, often making it a nightmare for the parent to bathe his little one. With this mat, you won't just be able to keep your toddler safe but also make bath time a fun and exciting activity for him and a less strenuous task for you. Posh Porschey is a silly name and we do not care for it one bit. But the product in question is anything but silly. First, with its clear, rippled/pebbled design, the model looks really good and will be able to seamlessly blend with any bathroom décor. It often comes wrinkled but, with a little time, the mat should smooth out. It feels really nice to the touch and doesn't feel all too bad under your feet too. 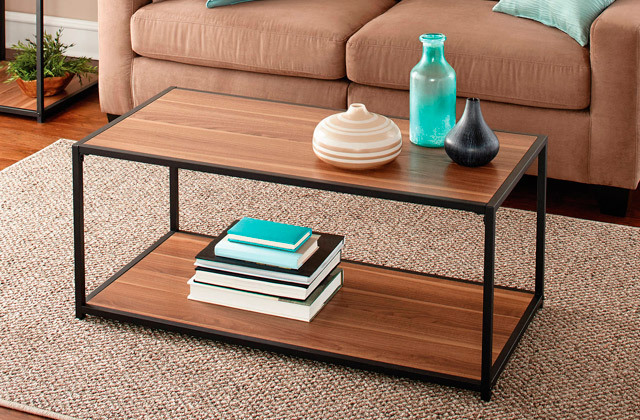 As far as anti-bacterial properties are concerned, the mat is up there with the best of them. It is also mould- and mildew-resistant, so you shouldn't have any hygiene-related issues with the product. Measuring 40 centimetres in width and 90 in length, you could put it in a shower stall and bathtub but you might not be able to fit the former, so keep in mind the length of the mat relatively to its intended place. Apart from that, it's the smaller things that aren't unique to this product but always welcome regardless. The fact that the model is perfectly machine washable is one of those things and the quality non-slip surface is another. It also doesn't hurt that the rubber here doesn't deform with time. In short, Posh Porschey Bath Shower Mat combines an attractive price with a well-thought-out and aesthetically pleasing design. 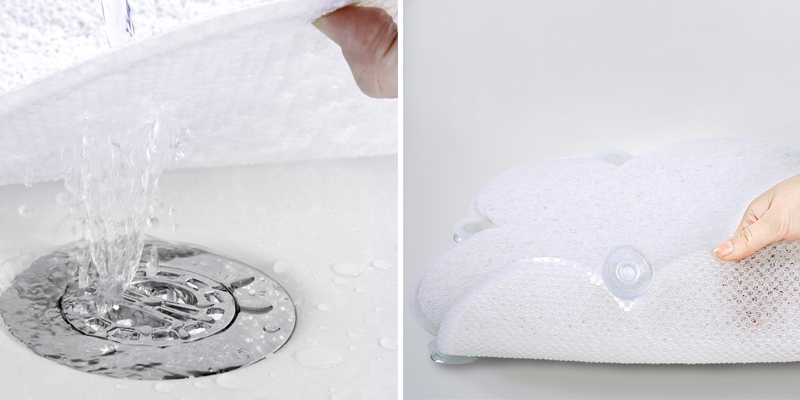 The product is durable and it will definitely prevent you from slipping in the shower/bathtub. As far as we're concerned, that is enough to make the list. What Is a Shower Mat? Most people shower every day and we don't really have anything to do with those who don't (bar people who simply do not have that option due to socio-economic reasons). We don't have to explain the benefits and why people should and do it. However, we would like to address the less known fact about showering - it is surprisingly dangerous. And we're not talking about the bacteria buildup or anything along those lines here because that is a topic for another time. No, all we're talking about here is a simple slip-and-fall scenario. Every year, approximately 6000 (yeah, that's six thousand) people die from accidentally tripping and falling somewhere in their home. As you'd imagine, more often than not, that happens in the bathroom because the surfaces there are both slippery and hard. Fortunately, all it takes is a simple shower mat and you should be able to avoid these potentially life-threatening injuries. A quality mat like that will definitely prevent you from slipping in the shower and that might just save your life. 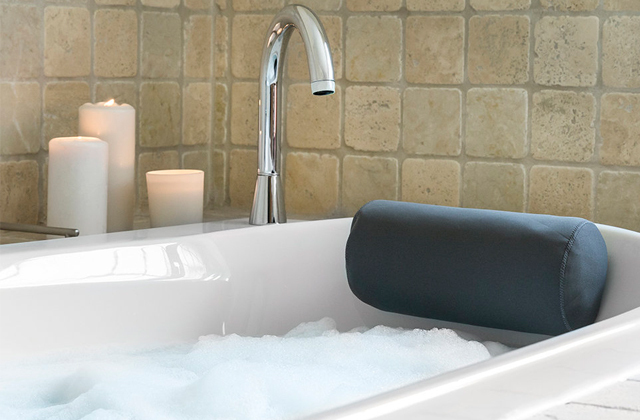 Of course, one of these mats will also allow you to properly enjoy bathing and showering, so you can go ahead and get yourself shower speakers or a bathtub pillow while you're at it.